The Republic of Chad, part of France's African holdings until 1960, endured three decades of ethnic warfare as well as invasions by Libya before a semblance of peace was finally restored in 1990. The government eventually suppressed or came to terms with most political-military groups, settled a territorial dispute with Libya on terms favorable to Chad, drafted a democratic constitution, and held multiparty presidential elections in 1996 and 1997. In 1998, a new rebellion broke out in northern Chad, which sporadically flares up despite two peace agreements signed in 2002 and 2003 between the government and the rebels. Despite movement toward democratic reform, power remains in the hands of a northern ethnic oligarchy. Amédée-François Lamy was a French career soldier and colonialist who headed a mission to successfully conquer Chad. 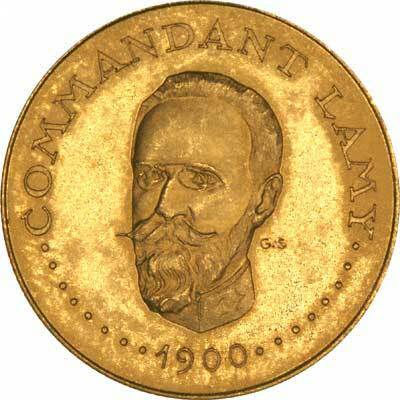 Its capital, Fort-Lamy was founded and named after him, by the French commander Émile Gentil on May 29, 1900. In 1973, it's name was changed to N'Djamena. The $ prices are subject to exchange rate fluctuations. 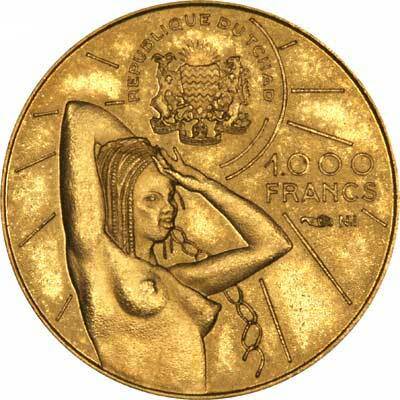 For silver and base metal coins of Chad, please look at our original Chard Coins website.